I just read every strip, and I’ll be laughing the entire week because of it. 😀 if i ever have a haircuttery of my own, this is SO going up on the wall! Biff is like a pasty-white version of the Tick- he’s invulnerable to all harm. hahahahaha…”ahead.” too clever by half! CHRIS! =D I COULD HUG YOU! You’ve seen Tick, too! SPO-O-O-O-O-O-O-N! doesn’t he have a brain? This look more painful than when my older sister tried clipping my nails and cut me. Ah biff first misfourtane, just look how much the artworks improved. and he ust be like the iron giant. The original Book Of Biff comic. how does biff manage to stay alive throughout these comics? your putting him through some pretty brutal stuff. haha. Oh, and nice blackened red barber stripes… Maybe he comes from an era of barbers that bloodletted people with chocolate blood? Days and days and finally here I am at the beginning! 😀 Love all the personal comments in the later comics… looking forward to the next 700. A friend sent me a link to this comic. Can’t believe I hadn’t seen it earlier. Biff strangely reminds me of certain family member. I love it. 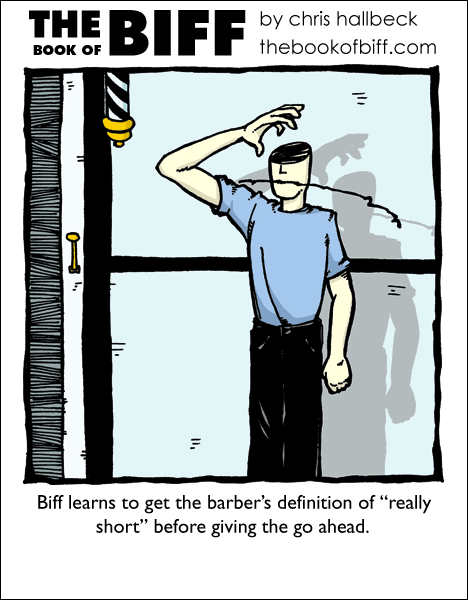 Chris, is this why Biff is bald in all the other comics? I am assuming that he was allready bald, and thats the reason the barber cut off the top of his head. Either that or he was getting his eyebrows cut… That explains the short eyebrow period! I like my hair at ungodly shortness. It’s the only way it looks decent. A little off the top, Mother Earth? Haha, read them all, including your little stories with them, thank FML for having a new reader 😀 Ahh.. you’re hilarious, well done mate. I think he can grow his hair if he want to… You know it, you have hair long to the waist and say to the hairstylist: ‘cut the ends only’, and you go outta there with shoulder length of hair..
…Read em’ all, in correct order, came back to gaze on the origonal…ah, memories. Last until someone else posts! Ziriath got it right: “You know it, you have hair long to the waist and say to the hairstylist: ‘cut the ends only’, and you go outta there with shoulder length of hair.” My hair is not waist-length (I wish! ), but it is elbow length, and at My age (fifty-five: ouch! ), I have no intention of waiting for it to grow back. Besides: No scalp means no brushing, no cutting, no lice, no shampooing. Except for the missing brain problem, it might work for him! Wait a minute, since when does Biff have hair!? Yup, the very first one. The artwork looks so different. As everyone else has said, the beginning of Biff’s misadventures. Thank you for making a wonderful, interesting and hilarious comic. Ahh, Biff’s very first misadventure.